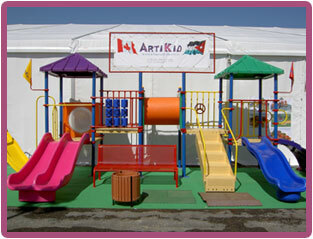 ArtiKid was established in Jordan with ten years of experience in the recreation and amusement business. Registered in 2002, as a separate industrial company under the Budeiri Group umbrella, ArtiKid continues to provide flexible and comprehensive solutions to indoor and outdoor recreational activities in Jordan and the Middle East. Our focus is to design, manufacture, distribute and install children’s playgrounds and park furniture at cost effective prices throughout the Middle East region. Our facilities utilize the latest technology and follow international safety standards; using plastic components and accessories from our strategic alliances in Canada and the United States guarantees highest standards. Our clients range from municipalities to small scale private/home users. That is why we believe in providing flexible solutions that cater to the needs, requirements and budgets of our various clients. Besides our designing & manufacturing products locally, ArtiKid is also the sole distributor in the Middle East for several of the world’s recreation industry leaders. This provides our clients with a wide range of options so that they can find exactly what they are looking for. Our experience is considered among the best and most impressive in the region. We have supplied and installed over 500 playgrounds in the Middle East. We have designed more than 12 Parks, Resorts and Amusement Centers. We have also supplied most of the Quick Service Restaurants in the Middle East region with their indoor/outdoor recreational & seating needs. Our vision is to promote and provide a highly entertaining playing environment for the children while maintaining the highest standards of safety.